Here at this page you’ll have DESCON Jobs Oct / Nov 2015 in UAE Latest Advertisement. Jobs in DESCON Engineering Limited are available, as we know that DESCON is a well reputed engineering company of Pakistan and Gulf Countries and it is looking to recruit following staff for its Shutdown projects in UAE and for this purpose it is seeking for highly educated, very experienced, hardworking and well disciplined candidates for the following positions such as (Area Engineer Shutdown, Area Planner, QC Inspector, Mechanical Supervisor, Welding Supervisor, Hydrojetting Supervisor and Material Coordinator). 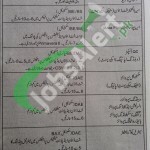 Candidates from all over Pakistan can apply for these international jobs, but there are some requirements for every vacant position which are mentioned below in front of positions which you can examine from the following image posted below and according to the criteria candidates having qualification BA, BE, BS, DAE are eligible to apply. So, interested candidates should read the following how to apply procedure carefully and apply accordingly. Interviews for the above mentioned positions will be held in Karachi and Lahore. Candidates should appear for interview along with updated CV, passport size photographs, Original Passport and coloured copy, Original CNIC & copy and copies of Academic and work experience certificates. In Lahore Interviews will be held on 28th, 29th October, 2015 at Descon Headquarters, 18-Km Ferozepur Road, Lahore. In Karachi interviews will be held on 31st October and 01st November, 2015 at Hotel Country In, 19-I-B, Block 6 PECHS, in front of Building of Bank-Al-Habib, Main Shahrah-e-Faisal Road, Karachi. No TA/DA will be paid to any candidate appearing for interview. Stay in touch with us and keep visiting our site JobsAlert.pk for further updates. For Lahore: 28th, 29th October, 2015 at Descon Headquarters, 18-Km Ferozepur Road, Lahore. For Karachi: 31st October and 01st November, 2015 at Hotel Country In, 19-I-B, Block 6 PECHS, in front of Building of Bank-Al-Habib, Main Shahrah-e-Faisal Road, Karachi.